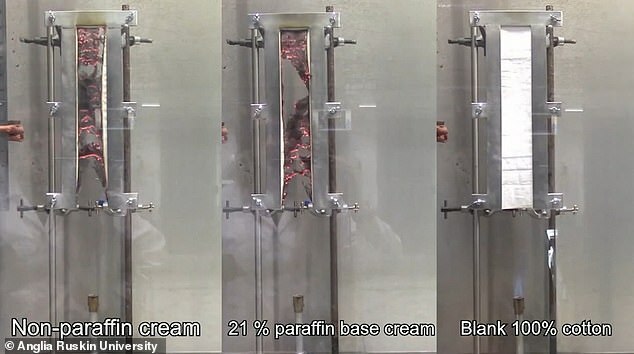 A shocking video has revealed how skin creams could cause clothes to burst into flames in seconds. Scientists released the footage as part of a warning to people using emollient moisturisers for conditions such as eczema and psoriasis. In the footage, cotton with emollient dried into it caught fire in just seven seconds. The study comes as experts and the fire service warn people even creams which don’t contain paraffin – known to be flammable – pose a serious danger. At least 50 people are known to have died in fires accelerated by the moisturisers in the UK, experts said, as they warned people of the risks. Forensic scientists from Anglia Ruskin University, based in Cambridge, carried out the fire tests by suspending pieces of cotton above naked flames. They found cotton which had previously been soaked in an emollient – whether that contained paraffin or not – caught fire in less than 20 seconds on average. Whereas plain cotton withstood the flames for an average of 65 seconds before burning – by which time the contaminated fabrics had disintegrated. The tests were carried out on different pieces of fabric with different thread counts and mixtures of cotton and polyester. Researchers warn all types of emollients – which are heavy duty moisturisers used by people with problem skin – can make garments and bedclothes more flammable. And washing the fabrics does not necessarily get rid of the problem, because the chemicals can become dried in – but it may reduce the risk. 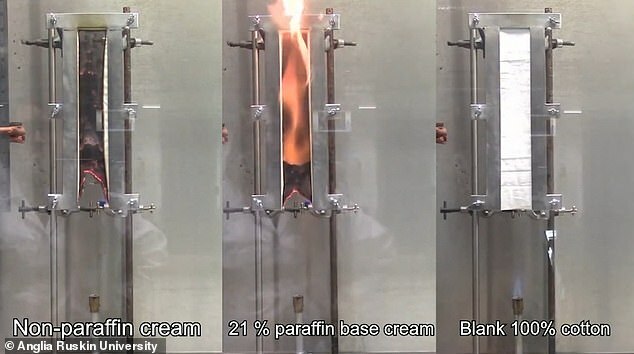 Anglia Ruskin’s Dr Sarah Hall said: ‘Our initial research focused on the range of paraffin-based creams, as this seemed the most obvious reason for flammability. ‘However, we are now seeing that fabric that has been in contaminated with any of these creams reacts in a similar way. The university did the work in conjunction with the National Fire Chiefs Council’s expert on the subject, Chris Bell. Mr Bell, who is also a watch manager for West Yorkshire Fire and Rescue Service, reassures people emollients are safe to use but advises people to avoid flames. ‘People should be aware that when using emollients they can come into contact with fabrics, clothing, bedding or bandages which then dries leaving a flammable residue,’ he said. ‘The fabric can then be easily ignited with smoking materials such as matches and lighters, naked flames or other heat sources. ‘We are asking people who prescribe, dispense or apply these products to be aware that switching to a lower or paraffin-free emollient will not reduce the fire risk. The research was published in the Fire Safety Journal. It comes after the UK’s Medicines and Healthcare products Regulatory Agency last year warned emollients should come with fire hazard warning labels. Smokers are particularly at risk, Mr Bell at the time, when he added people have died because they didn’t know cigarette embers could ignite their skin cream. Emollients with less than 50 per cent paraffin – a lubricant made of petrol or oil – had been thought to be safe in the past, while those with more already had fire warnings. But testing has now found even creams with no paraffin at all can build up in fabrics and make them quicker to burn in a fire. Flaming clothes, bedding or wound dressings can cause severe burns and even death when in contact with large areas of the body. A Medicines and Healthcare products Regulatory Agency warning last year revealed creams containing little or no paraffin can be soaked up by fabrics and make them flammable, after years of warnings those with paraffin carry the greatest risk. Figures in 2017 showed at least 37 deaths were linked to the creams between 2010 and 2017. But fire experts fear the link is underreported and senior firefighter and member of the National Fire Chiefs Council, Chris Bell, said the death toll could be in the hundreds. ‘Hundreds of thousands of people use them, we’re not sure how many fire deaths might have occurred but it could be into the hundreds,’ he told the BBC in February. ‘Unfortunately, that cream can get into fabrics, clothing, bandages and dressings, and become flammable.